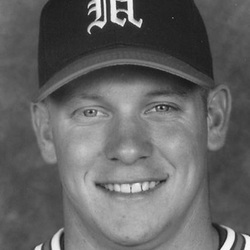 Jason Michaels was one of Coach Jim Morris' most potent offensive weapons during the school's NCAA record streak of College World Series appearances. The Tampa native still holds school records for most doubles in a season (32 in '97), most total bases in a season (189 in '97) and is tied for the record for most hits in a season with 106 in 1997, when he led the team in hitting with a .411 batting average. His RBI total for that same year (89) is 2nd all-time. He is 2nd in career slugging (.744), 3rd in career batting average (.396) and has the 2nd longest hitting streak in school history at 23 games. Michaels had his most dramatic impact in an elimination game during the 1997 Atlantic Regional at Mark Light Field, hitting a one out Grand Slam in the bottom of the ninth against Arizona State to keep the Canes alive for another trip to Omaha ! He was drafted by the Phillies in 1998 and has also played for Cleveland, Pittsburgh and last year for the Houston Astros. In 2006, Jason was selected as the Cleveland Indians nominee for the prestigious "Roberto Clemente Award", given annually to the major league player who exemplifies a committment to community service. He recently signed a one-year contract with the Astros and began his 9th season in Major League Baseball earlier this month. He lives in the off season in Tampa with his wife, Pamela, and they have a daughter, Payton. Jason was inducted into the UM Sports Hall of Fame at a ceremony prior to the Hurricanes 2010 season opening game against the Rutgers Scarlet Knights at Alex Rodriguez Park at Mark Light Field on Friday, February 19, 2010.